Perfect combination of purse and mobile phone case. Detachable Magnetic design make you can use the wallet and protective case indivadually. Outer magnetic flap closure and smart inner button closure to keep credit cards and cash safe. Soft leather,durable and fit your hand perfectly with great touching felling. Fashion design ,lightweight and portable,easy to carry. 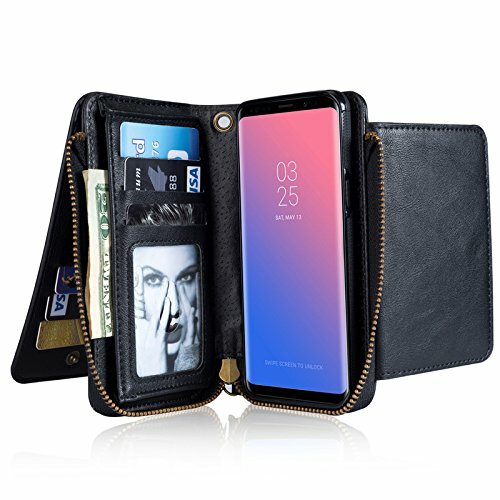 [Compatibility]:The wallet case is specially designed for Samsung Galaxy S9 Plus. [Zipper Wallet Case]: The phone is well secured in a close-fitting shell to ensure that it does not fall out from the case. Closed, the front flap of the leather case protects the display and prevents fractures. [Detachable Design ]: You can carry the phone case with your wallet or you can take it out of the wallet .Smart design allows you to grab cards and money easily and conveniently. [Precision Cut-outs]:Precision cut-outs for all ports, access to all controls and functions without removing the case. [Premium PU Leather]:The purse case is made of premium leather,fit your hand perfectly with great touching felling.Durable and resistant to wear and tear.